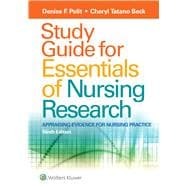 Study Guide for Essentials of Nursing Research is a companion to Essentials of Nursing Research. It reinforces key concepts covered in the textbook through a variety of question types and exercises that make it easy to remember essential information and build critical-thinking skills. Application exercises help you read, comprehend, and critique nursing studies. You will answer Questions of Fact, which guide you in reading the eight research articles in the study guide’s appendices, and Questions for Discussion, which aid you in assessing the merits of various aspects of the studies. Study questions pose queries about research studies that make you think critically about research reports and how to conduct research. Matching exercises challenge your ability to link related terms and concepts. Completion exercises test your memory and are a great refresher before an exam. Includes eight full research articles and answers to selected study guide exercises.